2 Safeguarding Children: Working Together Under the Children Act 2004. Everybody’s Business Why am I here? The interest of the child is paramount in all considerations of welfare and safeguarding. 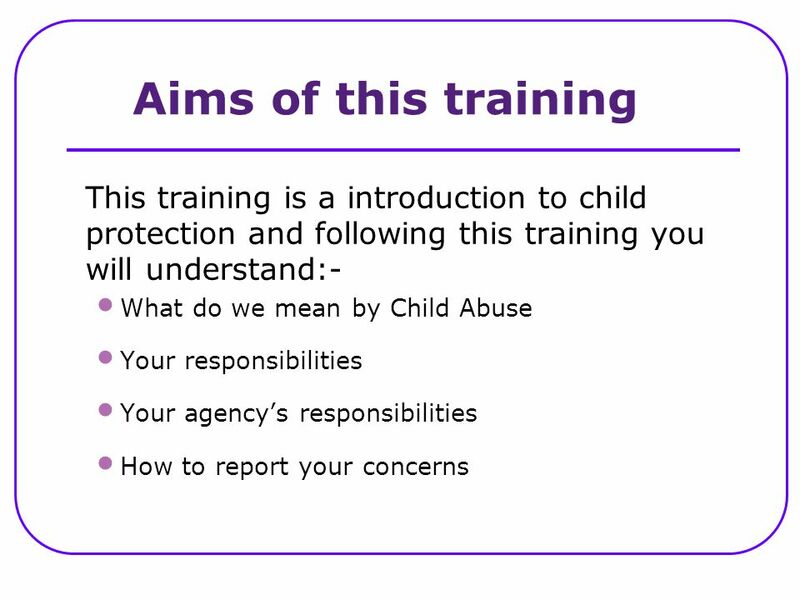 Safeguarding children is everyone's responsibility“ Safeguarding Children: Working Together Under the Children Act 2004. 3 Questions to ask What is my responsibility? Everyone is responsible for ensuring children are protected from harm. Do I have to go to Child Protection Training? Yes you do, the law says everyone who works with children, must have child protection training, and this is the start. What if I don’t work directly with children? 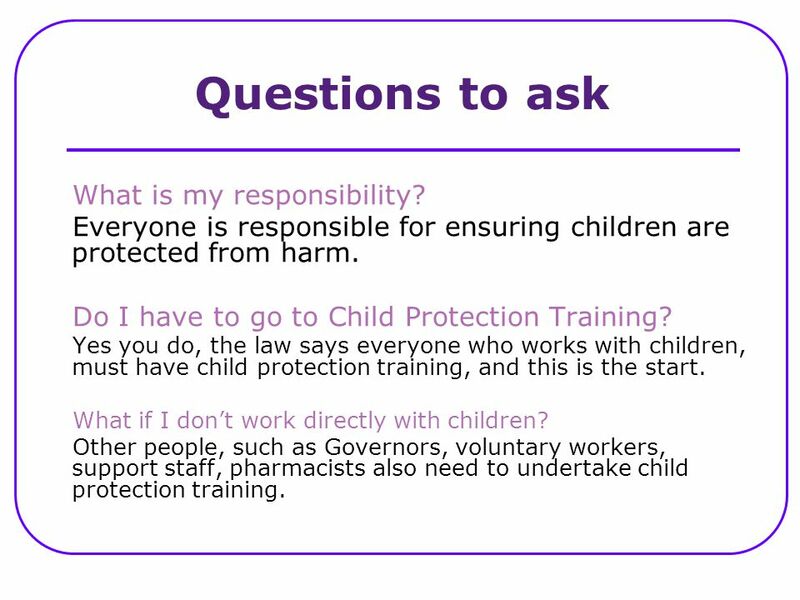 Other people, such as Governors, voluntary workers, support staff, pharmacists also need to undertake child protection training. 6 Physical Abuse Physical abuse may involve hitting, shaking, throwing, poisoning, burning or scalding, drowning, suffocating, or otherwise causing physical harm to a child. 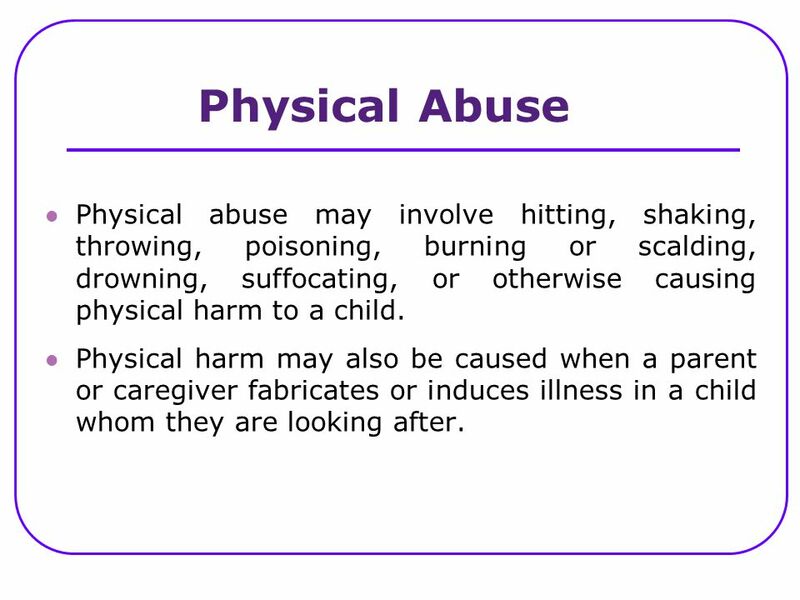 Physical harm may also be caused when a parent or caregiver fabricates or induces illness in a child whom they are looking after. 7 Sexual Abuse Sexual abuse involves forcing or enticing a child or young person to take part in sexual activities, whether or not the child is aware of what is happening. The activities may involve physical contact, including penetrative or non-penetrative acts. They may include non-contact activities, such as involving children in looking at pornographic material or watching sexual activities, or encouraging children to behave in sexually inappropriate ways. 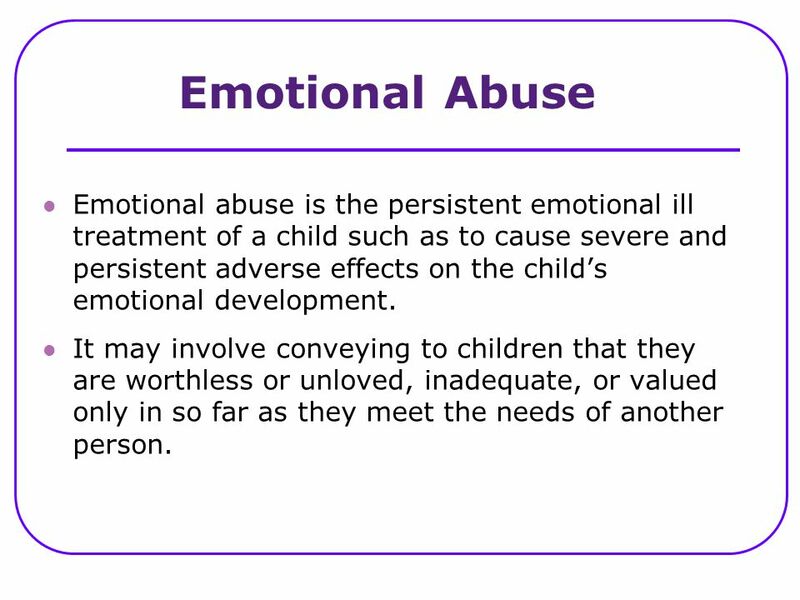 8 Emotional Abuse Emotional abuse is the persistent emotional ill treatment of a child such as to cause severe and persistent adverse effects on the child’s emotional development. It may involve conveying to children that they are worthless or unloved, inadequate, or valued only in so far as they meet the needs of another person. 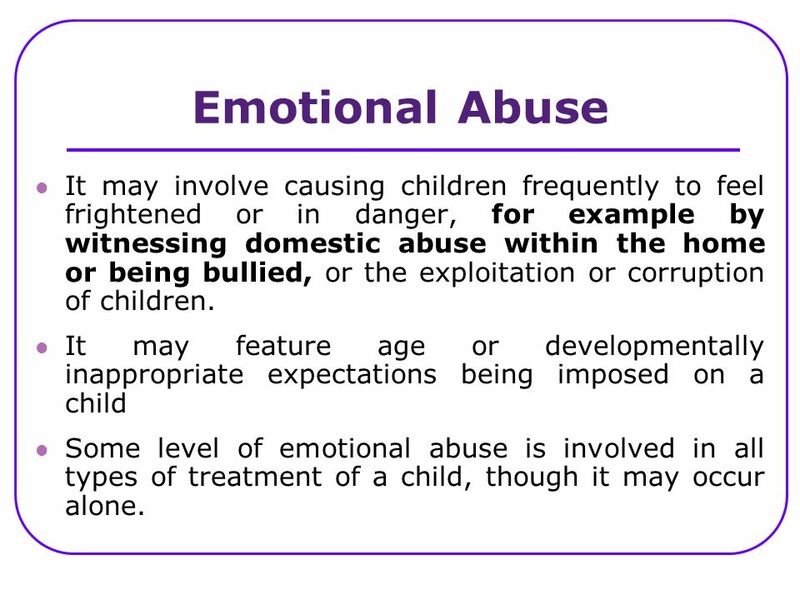 9 Emotional Abuse It may involve causing children frequently to feel frightened or in danger, for example by witnessing domestic abuse within the home or being bullied, or the exploitation or corruption of children. 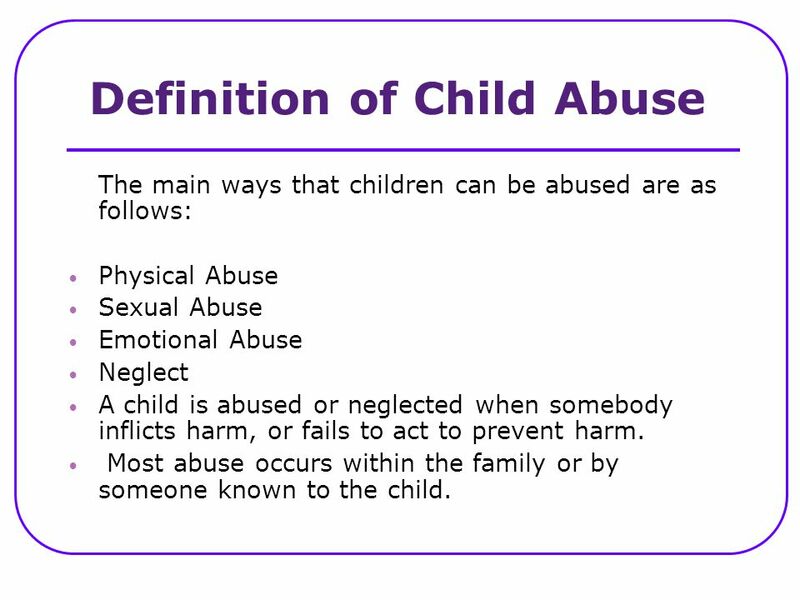 It may feature age or developmentally inappropriate expectations being imposed on a child Some level of emotional abuse is involved in all types of treatment of a child, though it may occur alone. 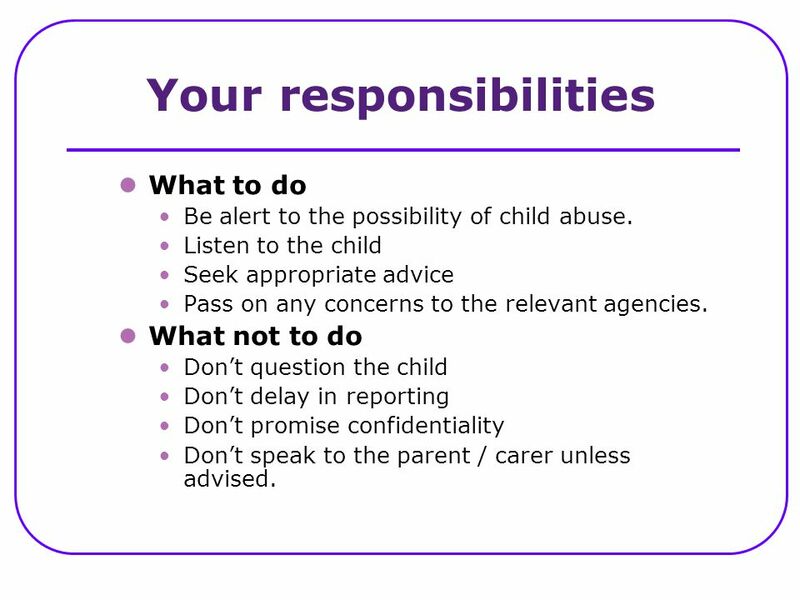 What to do Be alert to the possibility of child abuse. Listen to the child Seek appropriate advice Pass on any concerns to the relevant agencies. 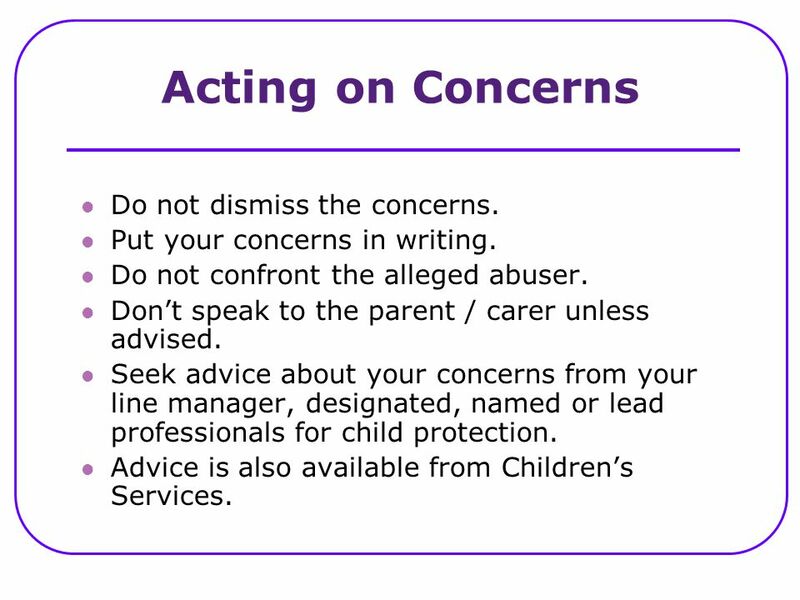 What not to do Don’t question the child Don’t delay in reporting Don’t promise confidentiality Don’t speak to the parent / carer unless advised. 12 Acting on Concerns Do not dismiss the concerns. Listen to everything the child has to say Do not appear shocked or disbelieving (even if you feel it). Allow the child to feel secure and give them time. Do not question the child. Do not promise to keep what they say secret. Explain the actions that you need to take. 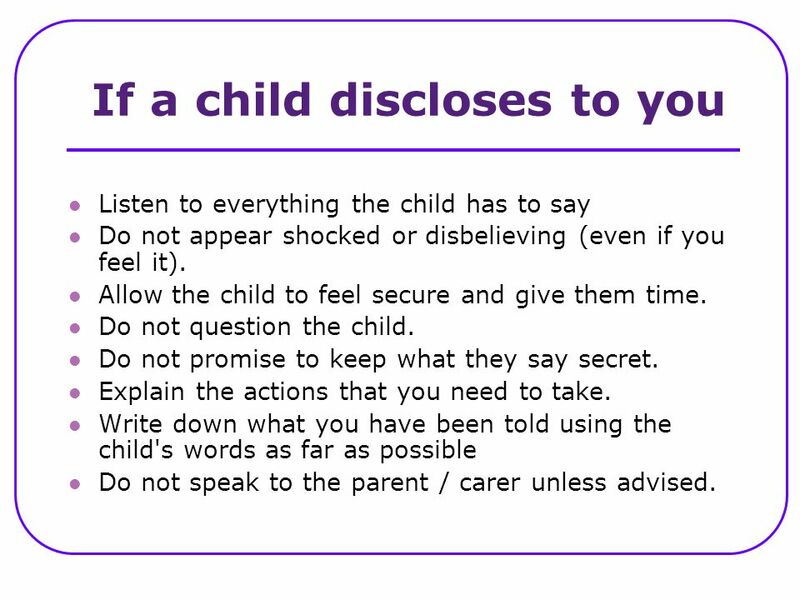 Write down what you have been told using the child's words as far as possible Do not speak to the parent / carer unless advised. 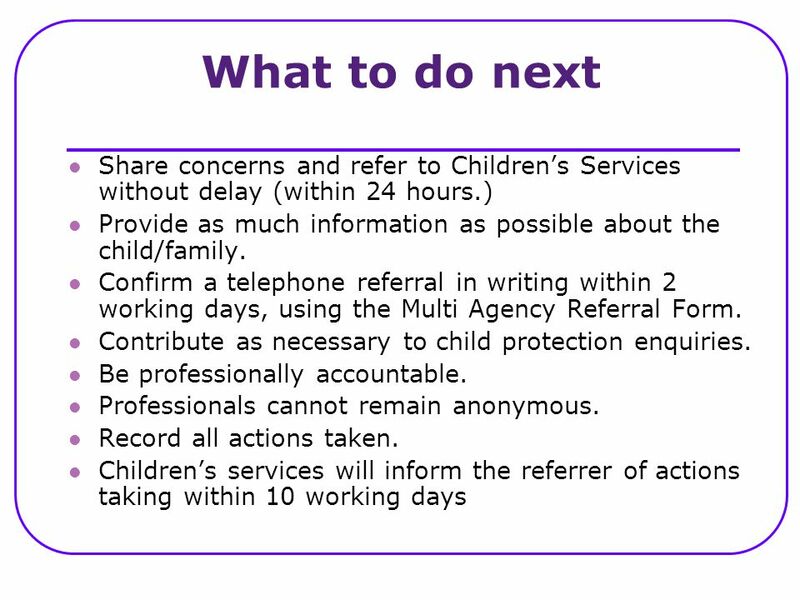 16 What happens next A referral will be made to Children’s Services. 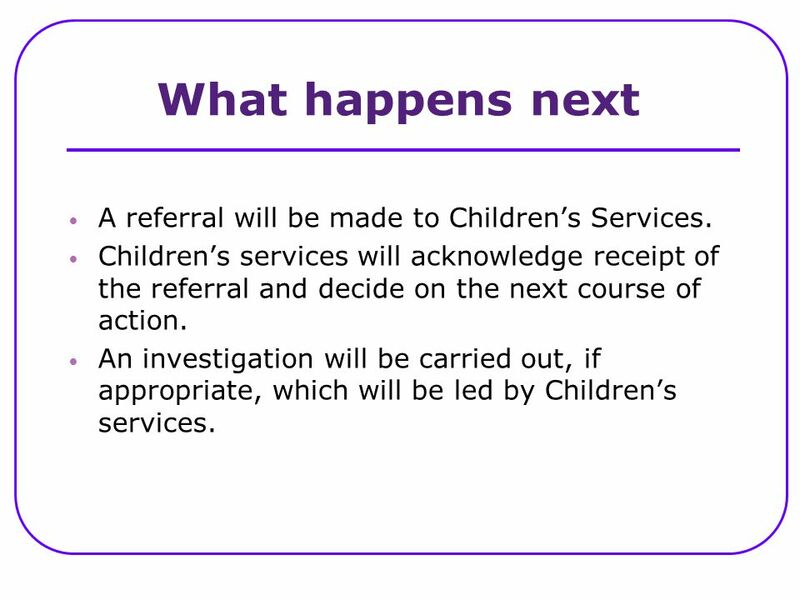 Children’s services will acknowledge receipt of the referral and decide on the next course of action. 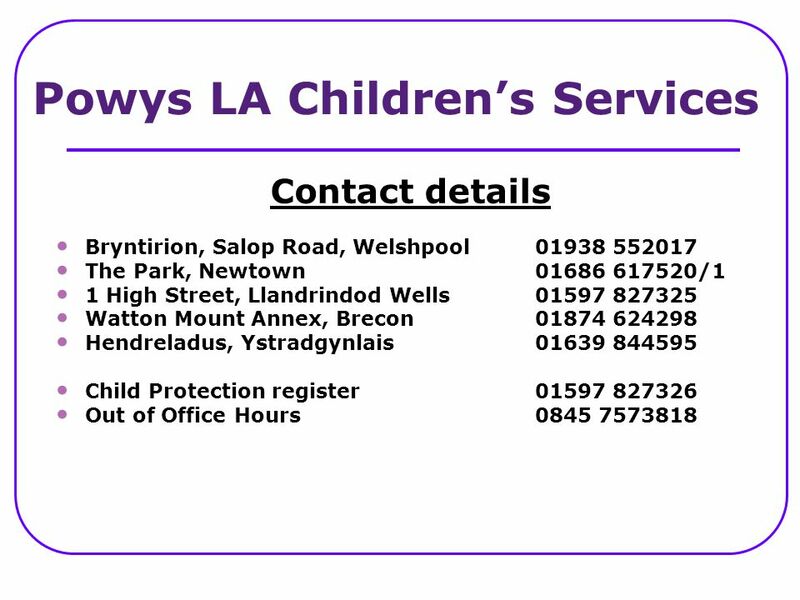 An investigation will be carried out, if appropriate, which will be led by Children’s services. 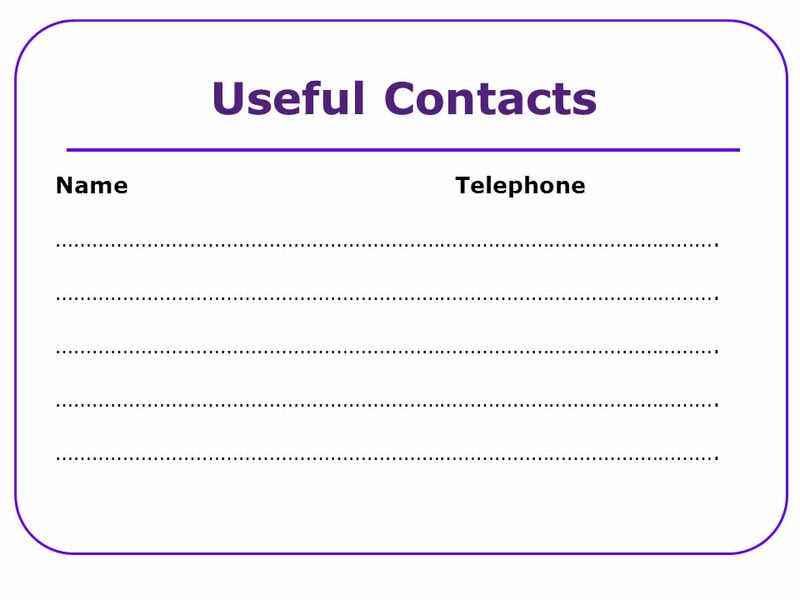 19 Useful Contacts Name	Telephone ………………………………………………………………………………………………. 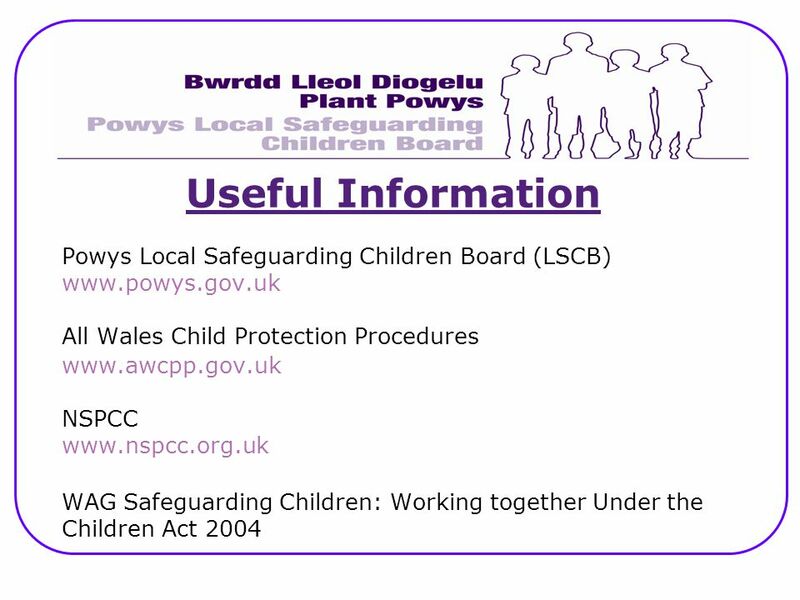 Download ppt "Powys Local Safeguarding Board (LSCB)"
Metropolitan Police Child Abuse Investigation Command SAFEGUARDING CHILDREN & INNAPPROPRIATE CHASTISEMENT DS Vicky Washington DC Tina Pearce Partnership. 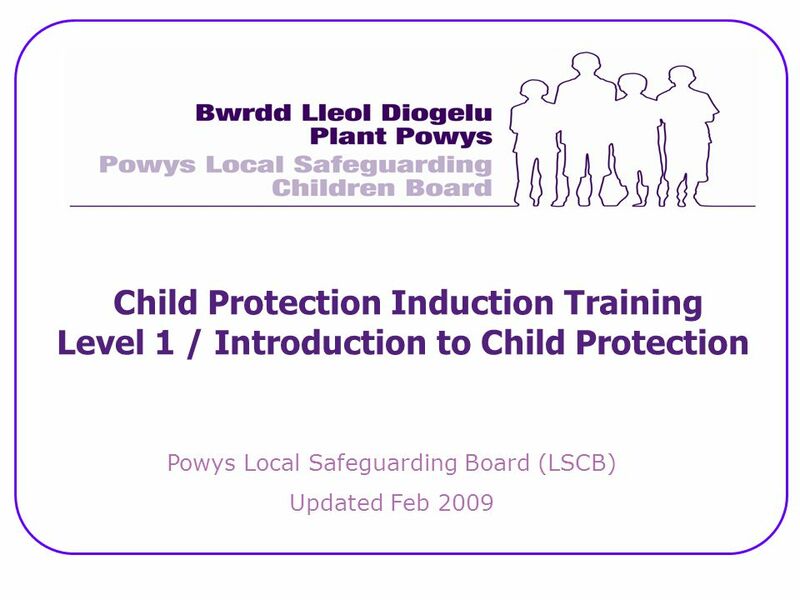 An Introduction to Child Protection. Outcomes Understand that it is everyones responsibility to protect children Be aware of signs, indicators, definitions. Child Protection Whole School Staff Training. The BIG Picture Reduction in child deaths nationally since school and multi-agency training began. 200 cases.  Nationally Children’s Services work within a legislative framework. Two pivotal pieces of legislation are the Children Act 1989 and the Children and. Safeguarding Children Contributed by Paul Hughes All resources in the "Safeguarding Resources" section of our resource bank have been submitted by delegates. CHILDREN IN WHOM ILLNESS IS FABRICATED OR INDUCED SUE THOMPSON SAFEGUARDING CHILDREN NURSE SPECIALIST. RGN;RHV; BSC (Hons); MA. Domestic Abuse. How may children be affected?  It can pose a threat to an unborn child – domestic abuse often begins or intensifies during pregnancy. “It’s Everyone’s Job to make Sure I’m Alright” Protecting Children. Safeguarding Children.. What has this to do with me? Protecting children is everyone’s responsibility If you aware of anything that may impair an adult’s. Child Abuse EDPS 265 The Inclusive Classroom. 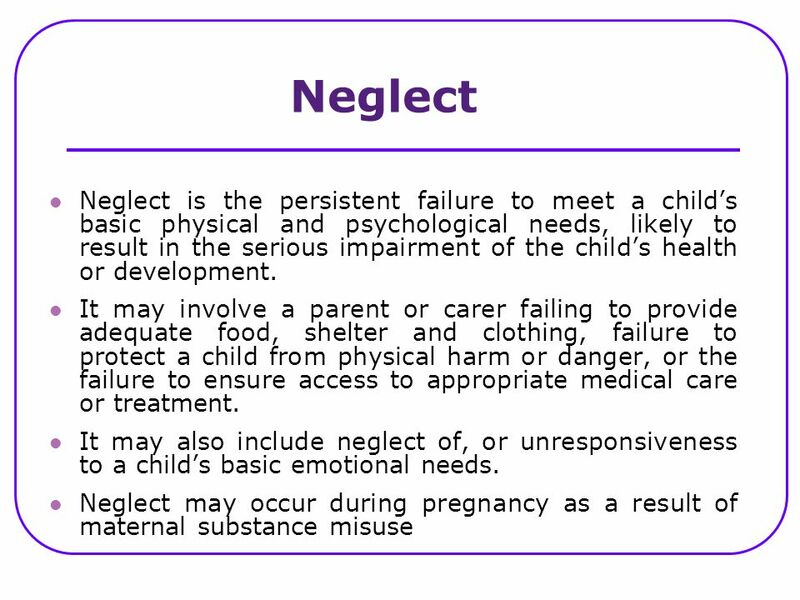 Agenda What is child abuse/neglect? What is a child in need? What are my responsibilities? How would I recognize. Mandated Reporter Training: Identifying and Reporting Child Abuse and Maltreatment/Neglect.